To properly germinate, some seeds need a period of cold, others need the warmth of spring, and a few even need a blazing fire to finally reach their potential. Once growing, however, all sprouts need the same basic ingredients to thrive: water, carbon dioxide, and photons. As with seeds, each business may need different conditions to start growing, but most of those growing businesses will need the same basic tools to really thrive. One of the most important of those tools is reliable financing, and one of the easiest places to start is with a quality business credit card. Two of the top business cards on the market for growing businesses are the sibling Chase Ink Business cards, the Ink Business Cash℠ Credit Card and Ink Business Preferred℠ Credit Card. Each card has its strengths and either would be a solid option for most small business owners. When comparing the Ink Business Cash℠ Credit Card and Ink Business Preferred℠ Credit Card cards, the most prominent difference you’ll likely notice is that each card uses a different rewards structure. As its name implies, the Ink Business Cash℠ Credit Card card offers cash back rewards, while Ink Business Preferred℠ Credit Card cardholders earn Ultimate Rewards® points for their purchases. Furthermore, each card has its own categories for bonus rewards. The Ink Business Cash℠ Credit Card, for instance, provides 5% cash back for the first $25,000 in combined purchases at office supply stores and on internet, cable, and phone services, while also offering 2% cash back on the first $25,000 in combined purchases at gas stations and restaurants. The $25,000 limit on bonus rewards resets each anniversary year. The Ink Business Preferred℠ Credit Card, on the other hand, has a single bonus level, providing 3X points per dollar on the first $150,000 in combined purchases for travel, shipping services, internet, cable, and phone services, and advertising purchases on social media and for SEO. As with its sibling card, the Ink Business Preferred℠ Credit Card‘s $150,000 purchase limit for bonus rewards categories resets each account anniversary year. Ink Business Preferred℠ Credit Card cardholders also get an additional 25% boost to their rewards points when they redeem the points for travel through the Chase Ultimate Rewards® portal, but it does charge an annual fee that the Ink Business Cash℠ Credit Card card does not. Both cards also offer unlimited 1% rewards (or 1X point per dollar) for all non-category purchases and all category purchases over the annual spending cap. With the only overlapping category being for communications services that nearly every business can use, the other bonus categories can be a quick way to decide between the two business cards — and so can the spending caps. For some businesses, the $25,000 purchase cap per bonus tier doesn’t leave enough room for optimal savings. Essentially, if you have a smaller business that would benefit most from a discount on office supplies and company lunches, then the Ink Business Cash℠ Credit Card may be the best choice. For companies with more annual expenses, particularly those associated with larger businesses like shipping and advertising, the Ink Business Preferred℠ Credit Card is the more obvious selection. As reflections of the general rewards offered by each card, the signup bonuses may also be an important differentiator for prospective cardholders. The bonuses are just as disparate as their cards, starting with the fact that the Ink Business Cash℠ Credit Card provides a cash signup bonus while the Ink Business Preferred℠ Credit Card gives a points bonus of Ultimate Rewards®. The value of each bonus also varies, with the Ink Business Cash℠ Credit Card offering a smaller bonus than the Ink Business Preferred℠ Credit Card. 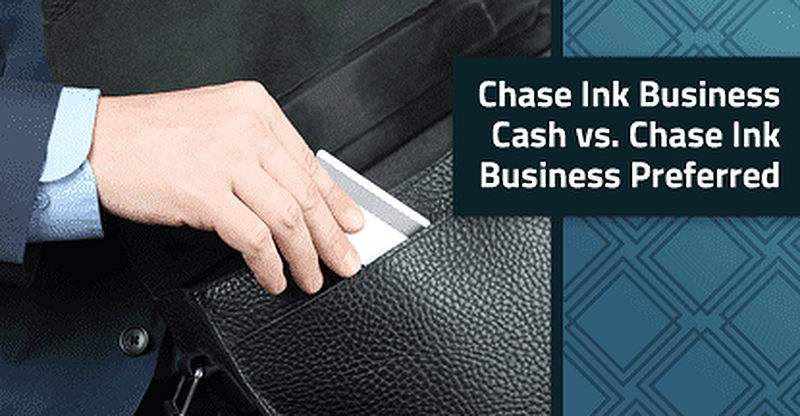 That being said, the minimum spending requirement for the Ink Business Cash℠ Credit Card‘s signup bonus is much lower than the requirement for the bonus given by the Ink Business Preferred℠ Credit Card, which may make the cash back bonus more attainable for businesses with fewer monthly expenses. Additionally, the Ink Business Cash℠ Credit Card comes with an extra signup promotion: an introductory 0% APR offer. This offer gives new cardholders interest-free financing for the life of the promotion, a bonus that may be more lucrative than even rewards for some businesses. The rewards you can earn with your Ink Business cards aren’t the only perks of being a cardholder. Both cards are Visa Signature Business cards, which means they come with a host of features from Visa, including purchase security and protection, access to Visa’s exclusive concierge service, lost luggage reimbursement, and travel accident insurance. As Visa Signature Business cards, both the Ink Business Cash℠ Credit Card and Ink Business Preferred℠ Credit Card cards come with additional benefits from Visa. Beyond Visa benefits, each card also has special benefits offered by the issuer, Chase, including zero liability protection for unauthorized card use and primary car rental insurance for business rentals. Plus, cardholders can add employee cards to their Chase Ink Business account at no additional cost. The Ink Business Preferred℠ Credit Card card also comes with a few extra travel benefits that might be familiar to Chase Sapphire Reserve® and Chase Sapphire Preferred® Card cardholders, including trip cancellation and trip interruption insurance should your trip be affected by sickness, severe weather, or other covered situations. Ink Business Preferred℠ Credit Card purchases are also free from foreign transaction fees, which can save you 2% to 4% per transaction. Cardholders of the Ink Business Preferred℠ Credit Card also have a lot of incentive to pay their cellphone plans with their card. Not only will you earn the 3X per $1 rewards for the bonus category purchase, but the Ink Business Preferred℠ Credit Card comes with cellphone protection that covers users (and employees listed on the monthly cell phone bill) in case of theft or damage. A maximum of three claims can be made in a 12-month period, and a $100 deductible applies per claim. Of course, the perks and rewards only really matter if you can qualify for the card in the first place. Since both the Ink Business Cash℠ Credit Card and Ink Business Preferred℠ Credit Card cards tend to require excellent credit for approval, qualifying may be a challenge for new businesses or business owners with poor personal credit. If your personal credit won’t qualify you for an Ink Business card and you’re still working on building your business’s individual credit, you may need to explore business credit cards with more flexible requirements. In general, business cards for businesses or owners with fair credit are limited to secured business credit cards, those from credit unions, and the Capital One® Spark® Classic for Business. Besides the credit requirements, applicants may be denied for a Chase Ink Business credit card due to too many recent credit accounts. That’s because Chase operates under what is known as the “5/24 Rule,” which basically states that those who have opened five or more credit or charge card accounts in the last 24 months will be turned down for a new Chase credit card. In the event your Chase Ink Business card application is rejected for too many recent accounts, your best bet may be to find a card from a different issuer. Thankfully, the world of small business credit cards is huge, with awesome options — rewards included — that will likely fit the needs of nearly any small business. While some businesses stay small, dominating their chosen niche with precision, other grow vast, covering the global marketplace with thousands of employees. Regardless of how large they become, however, each of those businesses had to start somewhere, like the seeds that turn into tiny flowers and giant sequoias alike. Whether your goal is to stay small but successful or grow into a Fortune 500 giant, your business needs the same basic tools to flourish — and financing may very well be the most important of all. But thankfully, finding quality everyday revolving financing for your business doesn’t have to be a lot of work. For example, when it comes to choosing between the Ink Business Cash℠ Credit Card and the Ink Business Preferred℠ Credit Card cards, well, you really can’t go wrong in most cases. Whichever way you go, you’ll earn bonus rewards in a business-focused category useful for the majority of businesses. Plus, maximizing your rewards is simple. Just select the card with the rewards categories and type you’ll use most often, and you’re good to go. Of course, you may not even need to choose at all; if both cards seem like they’ll provide significant value, pair the two to multiply your reward opportunities.